This study analyzes the effects of climate-related disasters on international trade in Southeast Asia. We use monthly trade data to examine the relationship between disaster shocks and bilateral export flows. The empirical analysis shows that natural disasters have a significant negative effect on exports. The estimation results suggest that floods cause an immediate decrease in exports by 3–5% of monthly mean export values. In addition, the effect persists in the post-disaster period, with floods causing annual export losses of 2% of average export values. 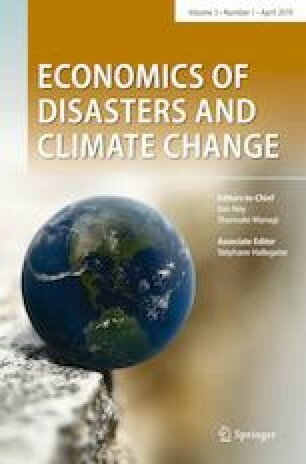 We further investigate the impact of disasters by product group, and show that disasters are negatively associated with the exports of agricultural and manufacturing products. The findings suggest that extreme weather events have severe repercussions on Southeast Asia, where exports play an important role in economic development. The authors would like to thank the Editor-in-Chief Professor Ilan Noy and two anonymous reviewers for their valuable comments and suggestions. This paper has benefited from helpful comments by the attendees at the 6th World Congress of Environmental and Resource Economists and the 23rd Annual Meeting of the Society for Environmental Economics and Policy Studies. We appreciate insightful feedback and constant encouragement from Masanobu Ishikawa, Kentaro Miyanaga, Kazuki Kagohashi, and seminar participants at Kobe University and the Water Research Seminar (Mizu Kenkyukai). We also thank Jialu He for helping with data collection. This research was supported by JSPS KAKENHI Grant Number JP16H03006.